You may have had your glasses for years and still be able to see fairly clearly out of them. Because your glasses are helping your eyesight, you may not realize that the condition of your eyes themselves has changed. Changes are often gradual and, therefore, hard to notice. However, it is important to continue getting regular eye exams. You might be surprised to see how much your eyesight has changed throughout the year. Many people fail to associate their headaches with weakening eyesight. People do not always notice subtle changes in their vision. The brain, however, is affected and will work hard to correct your vision. This process drains energy and causes these types of headaches. For those who are nearsighted, focusing on objects that are far away can cause pain in the front of the head and above the eyebrows. People who are farsighted experience pain after looking at something very close for too long. Squinting helps one to focus and make their vision clearer. People often do not even realise that they are squinting. However, it is a clear indication that you may need new prescription glasses. Squinting not only strains your eyes but also leads to headaches. Overworking one’s eyes often just makes vision problems worse. Eye fatigue is usually caused by a number of problems, such as allergies or a lack of sleep. Such eye strain may last for 2 to 3 days. 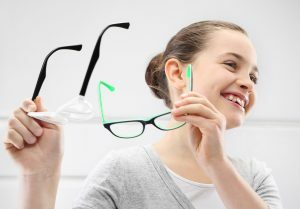 However if you are constantly experiencing eye fatigue, your eyesight may be getting weaker and you are likely in need of new prescription glasses. If you have been wearing the same pair of glasses for a few years, it may be time for you to change your lenses. Getting new lenses is necessary because eyesight typically tends to get worse over time. It is always a good idea to visit an eye doctor and to get an eye exams on a regular bases. Eye exams identify previously undetected problems with your eyes, and evaluate pre existing symptoms, such as weakened vision or severe headaches. Your prescriptions tends to change over time as your eyes change. People tend to see flashes when they look at a bright light or the sun for too long. However, if you are experiencing flashes after you look at a mild light, or if you experience them for no clear reason, you are likely in need of new prescription glasses. It’s important to make regular appointments to ensure that your prescription is well-suited to your needs. Any unusual symptoms, such as those mentioned above, should be reported to your eye doctor. Schedule an appointment at Hacienda Park Optometry today to ensure your eye’s continuing health!